The next version of Asset Forge will be a completely revamped version where we've taken a close look at every line of code in the program. The complete system will be translated to C# which will improve performance and allow multiple developers to work on Asset Forge in the future. We're also improving components like the toolbox. Filtering blocks, changing the size of thumbnails, a drop-down list for collection selection and tooltips are just some of the new features. While it might be a while for this version to hit (it'll be a free update for both standard and deluxe owners) we'll be releasing a content only update soon which will add new collections and blocks. Since these will be easy to port between the currently available version and the revamped version in development. We also hope to 'unlock' some of the tabs and features currently unavailable and faded in the released version. Stay tuned and feel free to suggest/request blocks in the comments below! Hello when will this be available? We don't have a set release date but we're still working on it. Hey Kenny - just wanted to say thanks so much for releasing this tool, looking forward to seeing the new tiles and textures. I'm a programmer and although I can use Photoshop and the real, real basics of 3D tools - Asset Forge is probably one of the most useful tools I've come across and it'll save me a huge amount of time. I've already played around and to be able to render my own isometric or top down assets, but keep the source (and build) in 3D is amazing stuff. My day job is a programmer and I'm in the process of writing my own game and to be able to make my own assets is pretty darn awesome. Sorry if this has been asked before, but will this eventually get features such as vertex maniplulation? I would like the ability to deform blocks, but I have really liked what I have used of it so far! I love Asset Forge and cant wait till these improvements and blocks! PS, Can I get a refund because I didn't know Asset Forge Deluxe was on sale and i cried because i wasted my money on a standard version that cost the same as a deluxe version! PS, I didn't actually cry but can i still have a refund, or a trade in for deluxe? Great to hear! What you're seeing is a 50% discount on Deluxe, this is not because it's on sale but that's the price you pay if you want to upgrade (so you didn't miss out on anything). Because you bought the standard version, you can upgrade to deluxe at any point for just the price difference. Thanks for your reply !! nice works. The drop-down for collections will be really useful. I've been using obj export to build "groups" of blocks that I then assemble into a larger model. I'm working on a mech game, so I'll for example make a single leg and then export it as a block. Sp improved switching between block sets will be very useful. That's awesome! Is that all in working order right now? (asking because while it does technically work, I've never tried it myself). But indeed, creating groups would be better. great work so far. I am thinking of buying Asset Forge. I read that some updates will be free, like the next one and some will be paid. What would be a paid update and for what timeframe would that be? Thinking if it makes sense to wait..
Heya! 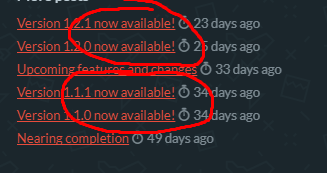 Not sure where you read that updates will be paid but for the time being there are no plans for paid updates, just free ones. Thanks for the quick reply and clarification. Sorry, it may be was just an assumption from my side. This sounds very good!!! I bought into the asset packs a long long time ago. They've always provided same core version updates for free. If it becomes 2.0 they usually charge. About every 8 months or so I think. My honest advice is usually not to rush in. Often times the tools are barebones or only get partially done, and never reach their full potential before being discontinued. Wait until it does something you need. We never actually charged for updates. In the past we've released Kenney Game Assets which received 40 free content updates, then we released Kenney Game Assets 2 which received 20 updates and Kenney Studio which added new features for two years.